How can I keep my child safe without a traditional car seat or booster? Now you can! Keep your young children ages 3 and up safe without a car seat by using the revolutionary and wearable RideSafer® Travel Vest. It keeps your child safer in the car and doesn’t require a bulky car seat or booster. This convenient, compact and comfortable child restraint solution makes traveling with children ages 3 and over a breeze — and keeps them safe, too! Plus, it’s easy to store. Simply hang it up like a coat! We know safety is your number one priority when it comes to traveling with your child. 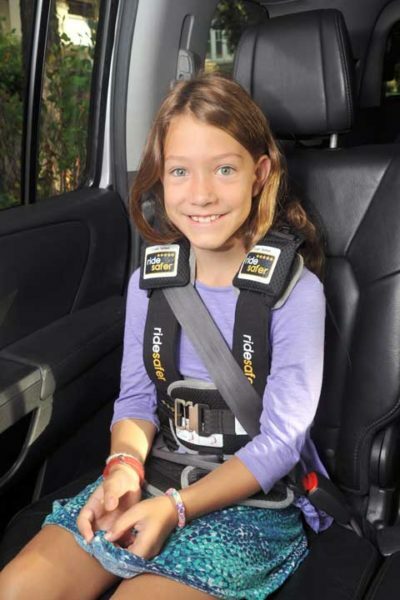 With the RideSafer® Travel Vest, keeping your child safely secured in her seat belt is easier than ever! The restraint system is worn like a vest — a much more comfortable (and transportable) alternative to car seats and boosters. Plus, it comes with a seat belt guide for proper positioning, making it easy to use correctly every time you get in the car! Lightweight and crash tested, the RideSafer® Travel Vest is designed for children ages 3 and older, between 30 and 80 pounds, until they can fit adult vehicle seat belts. With improved safety features over other currently available products, it’s the smartest alternative to a booster seat you should carry for your child. But wait, there’s more! Your kids will actually want to wear this vest! If you’re like many parents, you’ve battled with your kids to get them buckled in their car seats. You don’t blame them for resisting, but you also don’t give in. What if now you can — and without compromising on their safety or losing your Zen? Made of soft fabric and padding, and not hard plastics, the RideSafer® Travel Vest is the epitome of comfort. 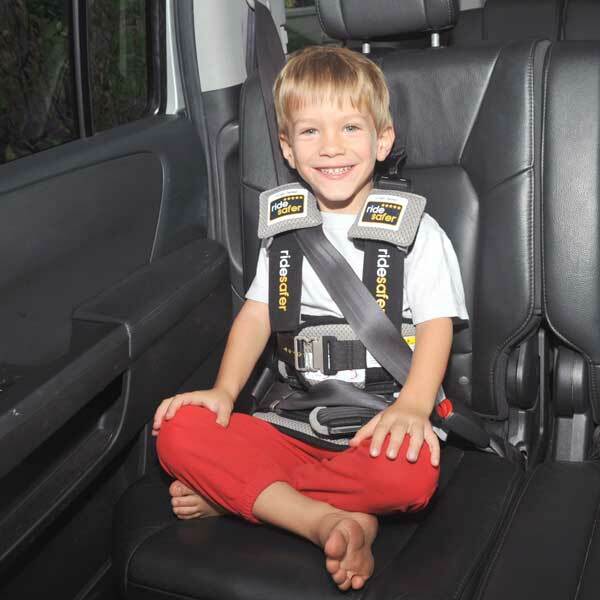 Keep your kids SAFE AND COMFORTABLE with the RideSafer® Travel Vest. Even kids with special needs are fans of this wearable wonder!